Me and @Bonxy have just got back from climbing Britain’s highest mountain, Ben Nevis. With little to no training we decided to tackle the biggest out of the 3 peaks, which probably wasn’t the best idea. We drove up Friday afternoon, and got to Fort William for around 8pm, took about 5hrs 30. At around 6am we got up and started preparing for the climb, but the midges in Scotland like to get up early as well, so before we got bitten to death we set off. It wasn’t the best of days for the weather, there was lots of clouds obscuring the mountains around us, which didn’t bode well for us getting some good views at the top. We made the quick walk to the Glen Nevis Visitor Centre and crossed the footbridge to start the climb, by this point I was already too warm and starting to sweat. Me and @Bonxy decided we would try and stop every 40 mins or so to catch our breath and take on some water, which worked out quite well, after around an hour we were in the clouds, and getting rained on, but I still wasn’t putting my jacket on due to how much I was sweating, we made it to the half way point with no real problems. One of the worries I had before the walk was about getting lost as we got up higher, but I needn’t have worried as there was two different charity events going on, plus plenty of people doing the three peak challenge, so there was a constant stream of people going up and down, plus the occasional traffic jam on the narrower sections. Soon after we hit the first of 8 switchbacks, these seemed to go on and on, but we could take a quick 2 min break at the top of each. On the final couple of switchbacks we started to see the snow, which at first was a welcome site, as it meant we were near the top, but with the lack of walking poles the going was tough as we kept slipping on the fresh snow and ice. Finally we reach the top and saw the crowd of people hiding from the wind around the stone shelter. Unfortunately due to the bad weather there wasnt much to look at, we had no reward from our hard walk apart from our quick lunch. A few picture later we were on our way back down. For me the walk down was worse, two and a half hours of trekking down the hill killed my knees, so I was very happy when we finally left the clouds behind and could see the valley floor. We decided to take the more direct route down which brings you out at the hostel, which might not of been the best idea with my dodgy knees, but it did get us down quicker. The whole walk took us around 6hrs 30, which I was quite happy with, we covered 16km in total, and my fitbit reckoned I took 35,000 steps and burnt around 5500Kcal. Next on the list are Sca Fell and Snowden to complete the three peaks. 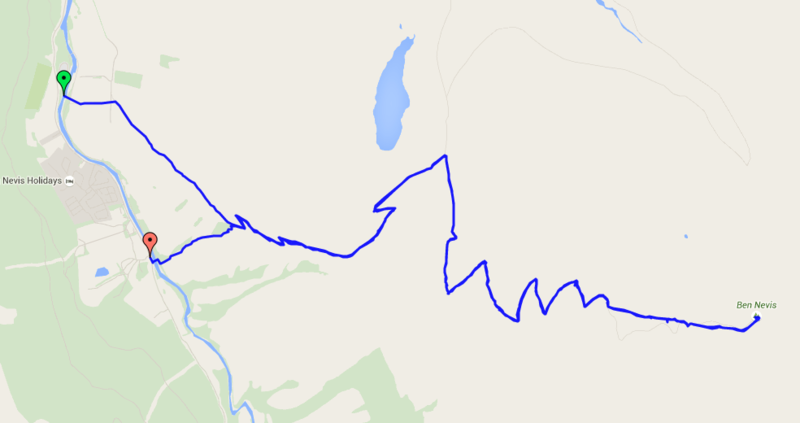 This entry is filed under Walking and tagged ben nevis, mountain, walk.